Images from Russian history and culture marked the opening ceremonies of the XI Paralympic Games in Sochi. The XI Paralympic Winter Games opened on March 7 at the Fisht Stadium in Sochi. Like the opening of the 2014 Olympic Winter Games, the ceremony incorporated elements of Russian history and culture. The ceremony opened with the appearance of a firebird, the bearer of light and luck. It was followed by a whirlwind of dancers portraying snowflakes. The performance included a number of acrobatic tricks. The Olympic flame was lit by Paralympic champions Olesya Vladykina and Sergey Shilov, Vladykina has won silver and bronze medals in swimming and Shilovholds three silver medals and a bronze for and ski racing. The climax of the ceremony was a scene involving the icebreaker “Mir” (peace). 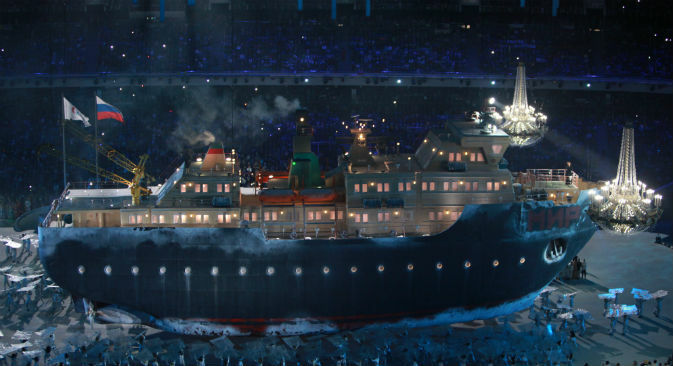 According to organizers, the icebreaker was an important symbol, since the Paralympic movement is intended to break the ice of stereotypes about people with disabilities. “I remember the Russian and English words, shaped on the stage and the large transparent balls that rolled on the field of stadium,” Mary said. Russian viewers of the ceremony were impressed by the selection of music for the parade of the Paralympic participants, which included the themes from many beloved Russian films. More than 2,500 volunteers and 1,000 actors were involved in the opening, including a number of participants with disabilities. Katya from Izhevsk and Ksenia from Barnaul are two of these volunteers. They participated in the parade of athletes – Katya carried the sign of the Republic of Korea and Ksenia – Slovakia. They also participated in one of the dances. They also performed during the Closing Ceremony of the Olympic Games on Feb. 23. The Paralympic competitions started March 8 and will last until the Closing Ceremony on March 16.